With Democrats and Republicans again fighting for control of the Washington state Legislature, the parties are targeting a handful of lawmakers in swing districts. OLYMPIA — One Republican state senator pushed hard for a new paid-family leave law and is endorsed by a gun-safety group, while another has backed a key labor bill and elimination of the death penalty. In Snohomish County, a self-described “extreme centrist” Democrat is taking heat from the left for his stances on gun regulations and from the right for his support of a property-tax plan to fund K-12 schools. And then there’s the Democrat considered by most in Olympia to be a Republican, who nonetheless helped advance a carbon tax proposal that even some other Democrats didn’t support. Welcome to politics inside Washington state’s swing legislative districts, where neither political party has a lock on the seats. 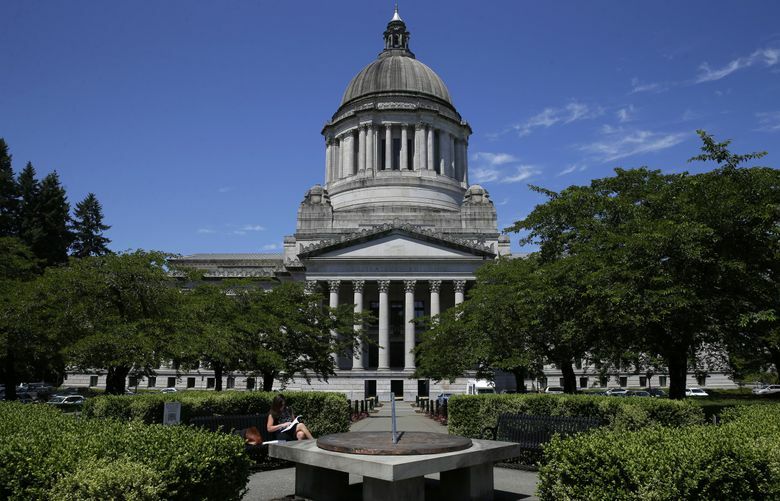 Nearly all of Washington’s 49 legislative districts reliably send only Democrats or Republicans to the state Legislature. But seven districts are represented by both Democrats and Republicans, down from 11 swing districts in 2008, according to legislative records. Four of those swing districts have Senate elections this year, which could determine whether Democrats keep their one-vote edge in that chamber. The parties eye these districts, with their often independent lawmakers, as places to pick up seats in the Legislature. In an April poll, Stuart Elway predicted control of both the House and Senate would likely be decided in Washington’s swing districts. The money is already flowing there. Of the 20 legislative candidates raising the most money so far this year, nine are in swing districts, campaign-finance records show. And some races are already seeing six-figure spending from outside groups in advance of the Aug. 7 primary. Money is pouring into the 30th District, where Sen. Mark Miloscia, R-Federal Way, faces perhaps the toughest re-election fight in the Senate. The 30th District, which includes parts of King and Pierce counties, voted for Hillary Clinton in 2016. Democratic challengers that year also beat both Republican House incumbents. Already, outside political groups have poured more than $447,000 into the 30th against either Miloscia or Democratic candidate Claire Wilson. Democrat Tirzah Idahosa is also running. Miloscia, a former Democratic House member who switched parties and was elected as a Republican in 2014, is known for his anti-abortion stance and a campaign to block safe-injection sites for drug users. He was outspoken in opposing lawmakers’ ill-fated attempt to exempt themselves from the Public Records act, and was the only Republican in either chamber to support Senate Bill 6199, legislation supported by unions to restructure how the state contracts with home health-care workers. He once sponsored a minimum-wage hike and is among a handful of Republicans pushing to repeal the death penalty. Wilson, president of the Federal Way School District Board, said she wants to find more state revenue by closing tax exemptions and instituting a capital-gains tax. That money, she said, should go toward education funding and to ease the burden of taxes on low-income people, such as the Sound Transit car tabs. Given his stance on women’s reproductive health and LGBT issues, she argues that Miloscia doesn’t do enough to represent everyone in the district. That means sometimes sponsoring compromise legislation to find a middle ground, he said, like his carbon tax proposal this year that was an alternative to the plan by Gov. Jay Inslee and other Democratic senators. “Maybe not the smartest thing politically,” said Hobbs, who is also a major in the Washington Army National Guard. Hobbs this year was reluctant to support a bill to raise the age to buy a semi-automatic rifle to 21 and require background checks for those purchases. The Alliance for Gun Responsibility has since declined to endorse him. Outside political groups have already reported spending close to $130,000 against him. One ad by a GOP-backed outside spending group criticizes Hobbs for sponsoring carbon legislation, as well as his votes on the bipartisan transportation package and property-tax plan to fund K-12 schools. “I have carved out a place in the middle, which I think represents most of my district,” said Hobbs, who added he won’t be voting for the carbon tax expected to be on the fall election ballot. Hobbs said he wants to focus on job creation and making sure the Legislature’s school-funding plan is executed. The senator this fall is likely to face Doug Roulstone, a veteran of the U.S. Navy and entrepreneur who unsuccessfully ran for Congress in 2006. Roulstone criticized Hobbs’ votes for some recent tax plans. “Where does all this end?” said Roulstone, of new taxes. Roulstone said he wants to focus on boosting vocational learning and special education. Also in the race is Jeremy Fitch, Libertarian. Fitch has raised less than $1,000. King County’s 47th District, which includes parts of Kent, Covington and Auburn, is perhaps the most politically dynamic district in Washington. Its House members include Democratic House Majority Leader Pat Sullivan and GOP Rep. Mark Hargrove, considered a reliable conservative. Somewhere between them sits Sen. Joe Fain, R-Auburn. He helped cut a bipartisan deal to pass 2017’s paid-family leave law, and has been endorsed by the Alliance for Gun Responsibility. Fain, an attorney, said he wants push for special-education funding — an area many lawmakers feel last year’s school-funding plan didn’t adequately address. He said he also wants to do more for transportation and also find ways to help people better save for retirement. This year he’ll face Mona Das, a Covington resident who owns a mortgage business. Das said she wants to push for a capital-gain tax and work to relieve homelessness. She says she would use some new revenue to lower car-tab fees for low-income people. Fain is way ahead of Das in fundraising. As of Friday, he had raised more than $283,000, compared to $63,000 for Das. The “D” by Sen. Tim Sheldon’s name causes heartburn in most Democrats. Sheldon, from Potlatch, Mason County, is the longest-serving legislator in Olympia. In recent years, he’s known for crossing the aisle to help Republicans form a governing coalition that put Democrats in the minority for several years. He describes the 35th District — which includes Mason County and part of Kitsap and Thurston counties — as the most rural in the state. Its biggest city, Shelton, has a population of roughly 10,150 people. His district has gradually trended red, with its two House seats flipping Republican in the past decade. In 2016, Mason County voted for President Donald Trump, after voting Democratic in the four previous presidential elections. Still, Sheldon this year joined Democrats to approve a ban on conversion therapy for LGBT people, and to pass a state voting-rights act. Sheldon also provided a key committee vote that kept Gov. Jay Inslee’s carbon tax proposal in the mix through the legislative session. His main opponent is Democrat Irene Bowling, a music studio owner who unsuccessfully ran against Sheldon in 2014 and for a House seat in the district in 2016. “He’s been in office for 27 years, and he has not developed the infrastructure to bring in new business, manufacturing, anything,” said Bowling. In 2014, Sheldon barely got through the primary, edging out a Republican in the top-two vote to face Bowling. This year, three Republicans are on the primary ballot, though George Sevier and John Martin don’t appear to be campaigning or fundraising and didn’t respond to requests for comment. The third candidate, Marco Brown, has no campaign website and said he won’t raise money unless he gets through the primary.